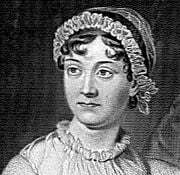 Jane Austen (December 16, 1775 – July 18, 1817) was an English novelist whose exacting literary craftsmanship, subtle irony, and insights into women's lives have greatly influenced the development of the English novel. While Walter Scott was developing the historical novel and fancifully exploring Scottish and English history, Austen limited her fiction to the lives and manners of the upper middle class of the English provinces, with little hint of great events transpiring on the Continent during the Napoleonic era. Austen's novels typically center on the lives of intelligent heroines embedded in family life who unmask falsity and pretension on the ultimate path to successful matrimony. Although modern readers may find that social rank plays an inordinate role in social and particularly marital attachments, qualities of character take precedence in Austen's fiction. The role of religion is largely formulaic, with clergymen performing a social as much as clerical function, and religious devotion and spirituality largely reduced to proper church attendance. Austen was a master of irony, and her novels stood out during her time (and are preeminent in the literature) for their astute observations, sophisticated dialogue, and realism of characters. Of her six completed novels, all of which remain popular both in print and film adaptation, four were published during her lifetime, all under a pseudonym. Austen endures over the more romantic and sentimental novelists of her time for the complexity and intelligence of her fiction, which is considered part of the Western canon. Jane Austen was born at the rectory in Steventon, Hampshire, in 1775, daughter to the Rev. George Austen (1731–1805) and his wife Cassandra (née Leigh) (1739–1827). She lived in the area for most of her life and never married. She had six brothers and one older sister, Cassandra, to whom she was very close. In 1783, she was educated briefly by a relative in Oxford, then Southampton. In 1785 and 1786, she was educated at the Reading Ladies boarding school in the Abbey gatehouse at Reading, Berkshire. In general, she received an education superior to that generally given to girls of her time, and took early to writing, beginning her first tale in 1789. Austen's life was a singularly uneventful one and, with the exception of a brief disappointment in love, tranquil and happy. In 1801, the family moved to Bath, the scene of many episodes in her writings. In 1802, Austen, at the age of 27, received a marriage proposal from a wealthy young man named Harris Bigg-Wither, whom she first accepted, but then refused the next day. Having refused this offer of marriage, Austen subsequently never married. After the death of her father in 1805, Austen, her sister, and her mother lived with her brother, Frank, and his family for several years until they moved in 1809 to Chawton. Austen continued to live in relative seclusion and began to suffer ill-health. It is now thought she may have suffered from Addison's disease, the cause of which was then unknown. She traveled to Winchester in 1817, to seek medical attention, but so rapid was the progress of her malady that she died there two months later and was buried in the cathedral. Adhering to contemporary convention for female authors, Austen published her novels anonymously. Her novels achieved a measure of popular success and esteem yet her anonymity kept her out of leading literary circles. Perhaps because of this isolation, Austen does not fit easily into the literary currents of her time. Writing during the golden age of romanticism, where stories of fantastical happenings and extraordinary passion were the norm, Austen stands out as strikingly unsentimental and realistic. Due to this, Austen has much more in common with her immediate predecessors and successors, the realists of the late eighteenth century such as Jonathan Swift and Daniel Defoe, and the modernists of the early nineteenth century such as Ernest Hemingway and F. Scott Fitzgerald, than she does with almost any of the writers of her own time. Romantic passion and sentiment are, on the contrary, emotions usually proscribed in an Austen novel. In her fiction it is more often than not the young woman who exercises rational moderation who is more likely to find real happiness than the one who elopes with a lover and dashes off for the Atlantic. This anti-romantic realism is evident in Austen's own literary tastes. In her few surviving letters that describe her literary interests, she expresses her admiration for the philosophers David Hume and John Locke over her contemporaries William Wordsworth and Lord Byron. In addition to Hume and Locke, Austen's favorite writers were Samuel Johnson, William Cowper, and Fanny Burney. Her posthumously published novel Northanger Abbey satirizes the immensely popular gothic novels of Ann Radcliffe, but Austen is most famous for her mature works, which took the form of socially astute comedies of manners. These, especially Emma, are often cited for their perfection of form, while modern critics continue to unearth new perspectives on Austen's keen commentary regarding the predicament of unmarried genteel English women in the early 1800s. Pride and Prejudice is the most famous of Jane Austen's novels, and its opening sentence is one of the most famous lines in English literature—"It is a truth universally acknowledged, that a single man in possession of a good fortune, must be in want of a wife." Its manuscript was first written between 1796 and 1797, and was initially called First Impressions, but was never published under that title. In 1811 and thereafter, it was revised and finally published on January 28, 1813 by the same Mr. Egerton of the Military Library, Whitehall, who had brought out another Austen novel, Sense and Sensibility. Like both its predecessor and Northanger Abbey, it was written at Steventon Rectory. The story deals with issues surrounding courtship and marriage among the landed gentry in the late eighteenth century and early nineteenth century. The main character is Elizabeth Bennet, a 20-year-old girl possessed of a quick mind, sharp wit, and keen sense of justice. Elizabeth's father, Mr. Bennet, spends much of his time hiding in his study, a refuge from Elizabeth's mother. Mrs. Bennet (whose manners and conduct are decidedly "of the people") is determined to see each of her five daughters successfully married to gentlemen of sufficient fortune to support a wife. The beginning of the novel describes Mrs. Bennet's excitement over the arrival of a single man "of considerable fortune" in their neighborhood. The man is Mr. Bingley, and after a short period he goes on a short trip to London and returns with his friend, Mr. Darcy. Shortly after their arrival, Mr. Bingley and his guests attend a public ball in the village of Meryton. At the beginning of the ball, Mr. Darcy is widely regarded as a most agreeable gentleman due to his fine figure and £10,000 a year. However, halfway through the party, the neighborhood comes to perceive him as a most disagreeable sort, one who believes himself above the country folk of Elizabeth's town. Mr. Bingley, on the other hand, proves himself to the neighborhood to be a fine, most agreeable gentleman. Shortly after the ball, Mr. Bennet announces to the family that a visitor will be arriving shortly. Mrs. Bennet and the girls amuse themselves with guesses as to who the man is, but are disappointed to find out it is only their cousin, Mr. Collins. Collins is a clergyman who tends to be wordy and snobbish, and whose idea of a pleasant evening activity is to instruct his female cousins, one of whom he hopes to marry, by reading to them from Fordyce's Sermons. Meanwhile, Elizabeth begins falling for a recently arrived military officer, Mr. Wickham, a man who claims to have been robbed of his rightful inheritance by none other than Mr. Darcy. While visiting Collins' estate for unrelated reasons, Elizabeth and Darcy end up spending a lot of time together, leading Mr. Darcy to eventually declare his love for Elizabeth and his desire to marry her "against his own will." Elizabeth is appalled and informs Darcy "he is the last man on earth [she] would ever desire to marry." The morning after her rejection of Darcy, Elizabeth runs into him on a walk. Darcy gives Elizabeth a letter before coldly leaving. In the letter, Darcy attempts to defend his actions to Elizabeth. Darcy also reveals Wickham's true character as a womanizing cad and opportunist. This throws all of Darcy's past actions in a new light for Elizabeth and gradually her prejudices against Darcy are broken down. Later, while on vacation with her aunt and uncle, Elizabeth finds herself persuaded to visit Pemberley, the estate of Mr. Darcy. While on a tour around the grounds, she bumps into him unexpectedly. His behavior, distinctly warmer since her rejection, begins to persuade her that his pride hides a true and generous nature. Finally, she comes to realize that despite her rejection at his first proposal he still loves her; she opens up her heart to him and both his pride and her prejudices are forgotten, ensuring their happiness. Marriage plays a large role in Pride and Prejudice and in all of Austen's novels. Some characters marry for security, some marry for wealth, and some marry for love. The idea of marriage is very important throughout her works, primarily because it was often the only way for a woman of the period to secure her freedom, social status, and living standard. Social classes are also taken into account and play a major role as a theme in Pride and Prejudice. People of higher class, such as Mr. Darcy, are very proud of themselves and do not generally socialize with people of a lower class. Jane Austen ridicules almost all of her upper-class characters; her heroes tend to be upper-middle or middle-class. An important theme of all of Jane Austen's novels is how to correctly assess people's character. Because Elizabeth Bennet and her sisters need to marry, and need to marry well, it is vital that they be able to "read" the men in their social circle—or they might end up married to an unprincipled, immoral man such as Wickham. Another major theme is that pride and prejudice both stand in the way of relationships, as embodied in the persons of Darcy and Elizabeth, respectively. Pride narrows the vision of a person and causes one to underestimate others. Prejudice blinds the vision and leads to false perceptions about others. Darcy’s pride and Elizabeth’s prejudice stand in the way of each understanding the other and keep them apart. Only when Darcy becomes more humble and Elizabeth becomes more accepting can they find harmony and happiness together. The novel, then, illustrates the most important and unique aspect of Austen's fiction: the sense that passion alone is not enough to secure a happy relationship. Other factors, including prejudices, must be weighed and thought through rationally by the characters in order for happiness to be achieved. During Austen's time such a calculated approach to romance was considered anathema; but today she appears as a strikingly realistic (and, since her protagonists are all women, strikingly feminist) author, one with a much greater degree of foresight than many of her contemporaries. Austen also earned the admiration of Macaulay (who thought that in the world there were no compositions that approached nearer to perfection), Samuel Taylor Coleridge, Robert Southey, Sydney Smith, and Edward FitzGerald. Nonetheless, she was a somewhat overlooked author for several decades following her death. Interest in her work revived during the late nineteenth century. Twentieth-century scholars rated her among the greatest talents in English letters, sometimes even comparing her to Shakespeare. Lionel Trilling and Edward Said were important Austen critics. Jane Austen? Why I go so far as to say that any library is a good library that does not contain a volume by Jane Austen. Even if it contains no other book. Austen's literary strength lies in the delineation of character, especially of women, by delicate touches arising out of the most natural and everyday incidents in the life of the middle and upper classes, from which her subjects are generally taken. Her characters, though of quite ordinary type, are drawn with such firmness and precision, and with such significant detail as to retain their individuality intact throughout their entire development, uncolored by her own personality. Her view of life seems largely genial, with a strong dash of gentle but keen irony. Some contemporary readers may find the world she describes, in which people's chief concern is obtaining advantageous marriages, to be unliberated and disquieting. But options were limited and in an era when advancement could not be achieved by mere hard work, both women and men often married for money and social standing. Female writers worked within the similarly narrow genre of romance. Part of Austen's prominent reputation rests on how well she integrates observations on the human condition within a convincing love story. Much of the tension in her novels arises from balancing financial necessity against other concerns: love, friendship, and morals. Seen in this context, Austen, despite the constraints placed upon women and especially women writers in the nineteenth century, was one of the most daring and important novelists of her time. In popular culture, Austen's novels have been adapted in a great number of film and television series, varying greatly in their faithfulness to the originals. Pride and Prejudice has been the most reproduced of her works, with six films, the most recent being the 2005 adaptation directed by Joe Wright, starring Keira Knightley, Donald Sutherland, Matthew Macfadyen, and Dame Judi Dench, as well as the 2004 Bollywood adaptation Bride & Prejudice, and five television series produced by the BBC. The 2001 film Bridget Jones's Diary included characters inspired by the novel. Emma has been adapted to film five times: in 1932 with Marie Dressler and Jean Hersholt; a 1972 British television version; the 1995 teen film Clueless; in 1996 with Gwyneth Paltrow and Jeremy Northam; and also in 1996 on British television with Kate Beckinsale. Sense and Sensibility adapted into four films including the 1995 version directed by Ang Lee and starring Kate Winslet and Emma Thompson (which won the Academy Award for Best Adapted Screenplay), and Persuasion has been adapted into two television series and one feature film. Mansfield Park and Northanger Abbey have both been made into films. The 1980 film Jane Austen in Manhattan is about rival film companies who wish to produce a film based on the only complete Austen play Sir Charles Grandison, which was first discovered in 1980. Jane Austen – e-books in easy to read HTML format. This page was last modified on 21 March 2018, at 14:40.